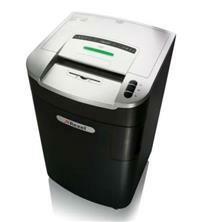 The Rexel Mercury RLM11 is a micro-cut office shredder which shreds paper into very small 1.9 x 15mm pieces. This gives it a P-5 security rating so it is suitable for both highly confidential and secret document shredding. Designed for companies with large shredding requirements, the RLM11 shreds up to 11 sheets of paper at a time and can also shred paper clips, staples, credit cards and CDs/DVDs. The waste bin is a large 115 litres (holding up to 1200 shredded sheets) and is a pull-out style for easier emptying. Either Rexel polypropylene sacks (code 40070) or Rexel recyclable sacks (code 2102248) can be used with the shredder. The shredder comes with a range of features including: Mercury Anti-Jam Technology so the shredder only attempts to shred stacks of paper within its sheet capacity limit; a door open safety feature whereby the shredder will stop if the door is opened during shredding; a reverse function; automatically lubricating cutters (just replace the oil when prompted, Rexel code 1760049); a separate CD bin to collect shredded CD shards; auto standby mode if the shredder isn’t used for more than 2 minutes; a self-cleaning mechanism when the waste bag is replaced to help clear paper debris from the cutters; and a bin full indicator.